Busy bee .. spring is here! Month three and I’m loving being part of the Garden Share Collective. A monthly community of like minded garden enthusiasts who want to share their vege patches, container gardens and the herbs they grow – the trials and tribulations of growing your own! Wow what a weekend. I woke on Saturday to crystal blue skies with a light breeze and loads of sunshine. Perfect day to give the feijoas a haircut. As Andrew had opted not to help (mean ah) I did 15 trees on my own – sporting a nice blister to prove it too! Truth is some of them are getting a bit big – but at least the birds can now fly in to pollinate them. Feijoas are just wonderful fruit trees … enjoyed immensely by us and the local wildlife, the turkeys! I also cleaned out chook towers with bucket of soapy water and lavender oil (smells divine) and popped in some hay into those nest boxes and more wood shavings for the floor. I’m going to trim back some lavender and will poke these branches also into the nest boxes, mites aren’t too fused on the smell. But more importantly, I have at last started sowing those seeds! Woohoo ..
Good start! Very very happy indeed. I used a bulb tray which was donated by a neighbour and covered the base of this with paper and then filled it up with a good planting mix. Once all labels were written and sitting upright in the soil, I then carefully emptied seed into my hand and then pinched it between fingers before dropping it onto the soil. Once all the seed was in situ, I sieved the soil mix on top of the seeds, removing any woody bits and also creating a fine even cover. A good spray of water and onto the heat pad (yay), a cat deterrent rack on the top and hey presto done and dusted. I only took a few snaps this time around but check out a previous post for more info. I must admit, I have changed my seed sowing technique ever so slightly but at the end of the day, as long as a relatively good medium is used, some heat from above or below (in my case) and regular watering you will have action! 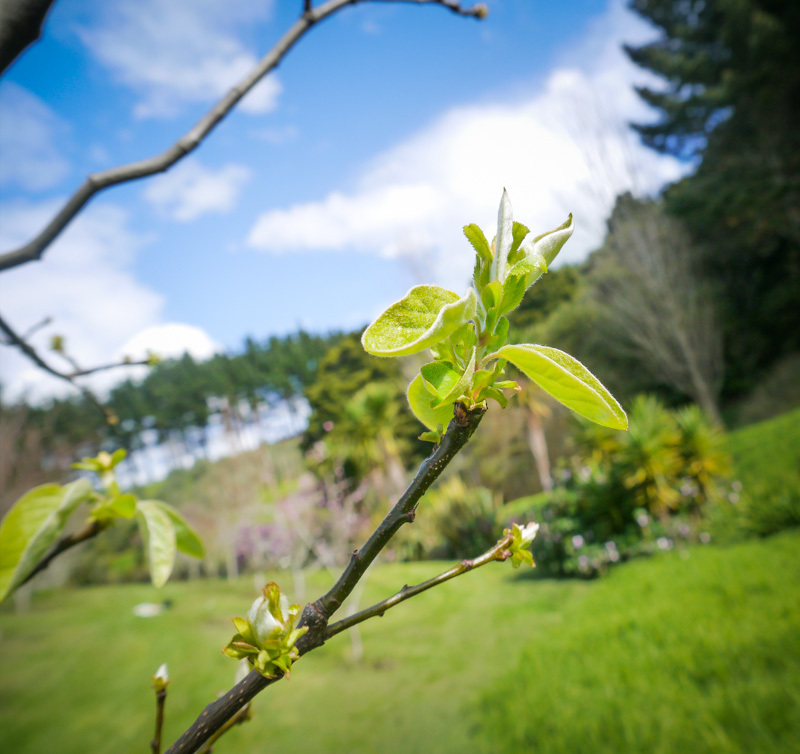 We awoke to another ripper of a day … a quick walk on the beach, a Sunday morning pottering season in the garden was followed by at long last finishing the pruning in the orchard. Namely the pears, just a minor trim mind you, although I did remove the quince branch on the pear growing superbly from the graft union. 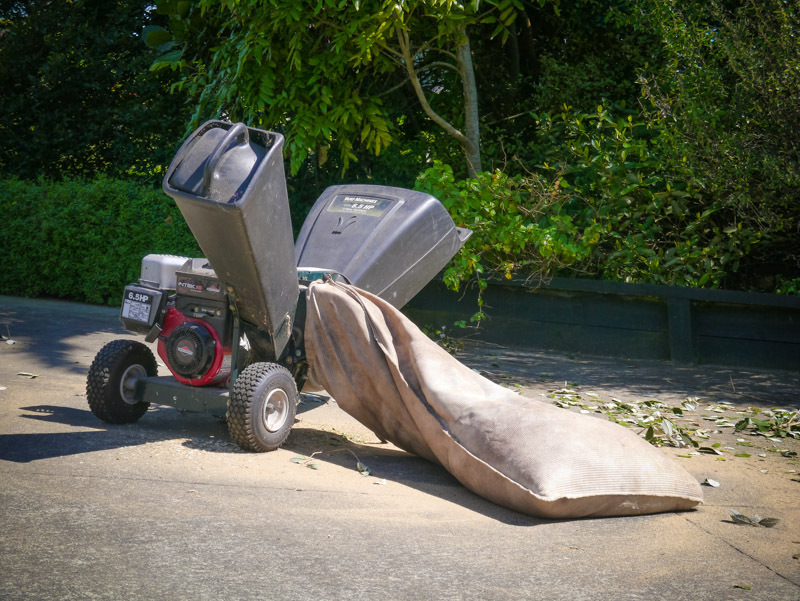 Andrew has also hauled the wood chipper out of the shed, blown away the winter cobwebs and mulched all my feijoa trimmings and some phoenix palm branches that have been waiting for such an occasion. Sensational! Bees loving this spring weather. What’s up for September? Well, I’m going to sow more seed, namely the cucurbit family plus we will mulch the orchard. Andrew has started fertilising trees with rok solid so that will also be completed. Always weeding to do and we can’t forget sloshing that homemade brew around my lovely vege garden! 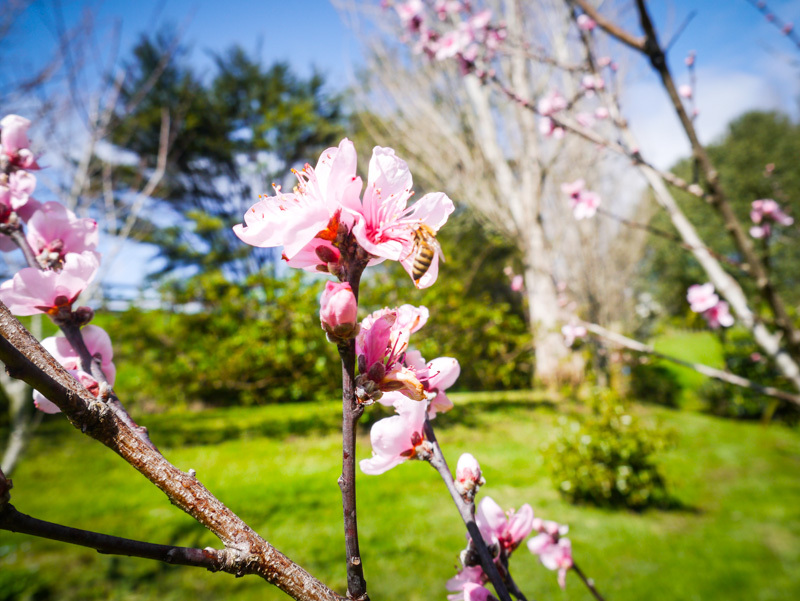 This entry was posted in Garden Update, Mulching, Orchard, Organic gardening in New Zealand, Seed sowing, The Garden Share Collective and tagged Bees, fruit trees, mulching, orchard, pruning, seed sowing. Bookmark the permalink. There is always weeding isnt there! I like the idea of a cat deterant rack I caught my cat Bro sitting in the seed trays on Saturday! 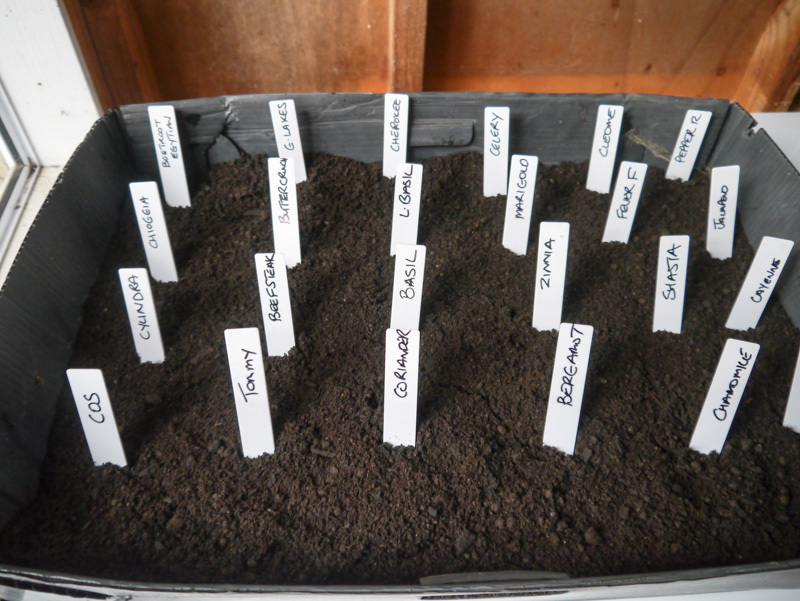 Great seeds tray and labelling. I tend to chuck a whole lot in and cross my fingers, I really shouldn’t though!! Sieving soil on top of seeds, a great idea that I will adopt! It’s a little tricky to otherwise put the 5mm of soil or less that some seeds require. No rest for the wicked. I love the days when the sky is blue the air is crisp but the sun warms your skin and the smell of flower blossoms in the air. Spring is here! I too label like mad with my seedlings, I am still trialing new methods every time I plant, still yet to stick to one until I have great success with it. Though at this time of year it is hard to go wrong with planting seeds its the perfect climate. Look forward to seeing all those seedlings pop out of the earth and get planted in to their new homes. 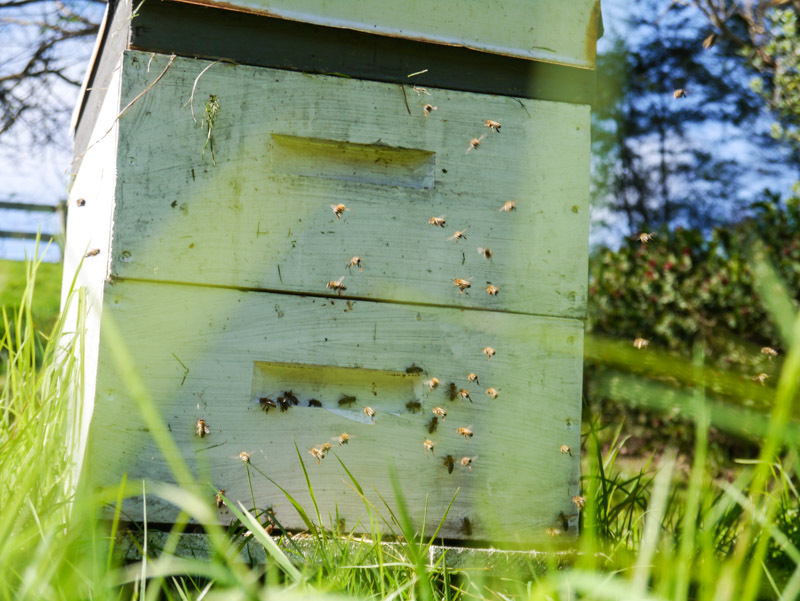 Your spring garden looks lovely and the bees obviously think the same! Hi Andrea … thanks, pouring cats and dogs today, thank heavens I got those pics over the weekend. Love those bees! Look at all your seeds tucked up warmly!!! I’m itching to get sowing…I’ll be back soon and will get cracking. I normally sow each vege in a separate tray but your way seems very neat and logical I might give it a go and invest in a heat pad too. My chook house is desperate for a clean…I looked up at the roof the other day and it is festooned with cobwebs! Your garden is looking beautiful…..